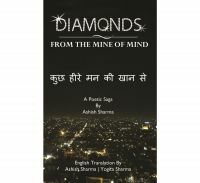 Like my last publication, "Diamonds from the Mine of Mind" is also a unique collection of Hindi Poems with English translations for everyone to enjoy. They are inspired by day-to-day events and occurrences in the world and my life. I have expressed my thoughts about social evils and issues, environment, relationships, happiness and hope, all in the form of poetry. I hope you will enjoy reading the book as much as I enjoyed writing it.